Turf grass is wonderful for the environment because it helps lower carbon emissions and cools the area around our homes. In fact, Michigan's Department of Agriculture has found that eight average-sized front lawns have the same cooling effect as 24 central air units. That's right-the temperature of your lawn on a hot summer day is about 20 degrees cooler than concrete and 10 degrees cooler than bare soil! What's more, grass is about three times more efficient at producing oxygen than trees. All this is to say that here at CheckAdvantage, we're big fans of grass. 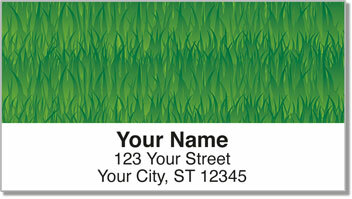 If you are too, then order your very own Grass Address Labels and matching Grass Personal Checks today!